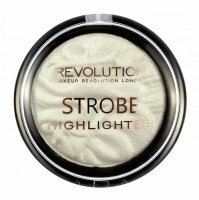 HD PRO STROBE REVOLUTION by MAKEUP REVOLUTION. 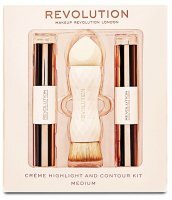 Face highlighting kit. The whole is placed aesthetic packaging, which will perfectly serve as a gift. 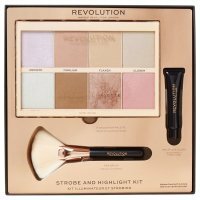 HD PRO STROBE - highlighters palette. 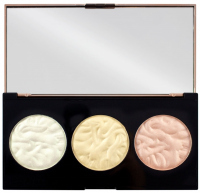 Contains 2 powder products (subdued pink and peachy) and 2 creamy products (iridescent pink and yellow-gold). 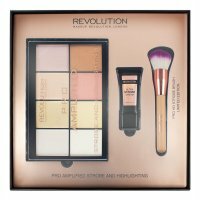 They will be perfect for highlighting the cheekbones, eyebrow arch, cupid's bow, inner corners of eyes, shoulders and neckline. PRO STROBE BRUSH - powdered or powder brush. PRO HD LIGHTS BRUSH - 'flat top' brush. The brushes were made of two-tone, synthetic bristles that are easy to keep clean and extremely soft. Heads were set in pink-gold ferrules. The light-pink handles are adorned with manufacturer's logo. The whole looks tasteful and elegany. Brushes come from limited edition. STROBE STICK - highlighting stick. For use on eyebrow arch and inner corners of eyes. Available in opalescent yellow and gold shades. ETHYLHEXYL PALMITATE, MICA, DIMETHICONE, OZOKERITE, ISONONYL ISONONANOATE, CAPRYLYL METHICONE, PROPYLPARABEN, BHT. MAY CONTAIN: CL77891. MICA, DIMETHICONE, SILICA, NYLON 12, MAGNESIUM ALUMINUM SILICATE, PHENOXYETHANOL, METHYLPARABEN. MAY CONTAIN: CL77891, CL77491, CL77492, CL77499.